Having issues after successfully flashing the firmware? Only few weeks after the leaked Android 4.3 update for Galaxy S4 GT-I9505, an official Android 4.3 update has been released by Samsung today in Germany. And we’re pretty sure other regions would also get the update in the next few days. However, if you’d like to install the update now on your device, below is a helpful guide to help you update your Galaxy S4 I9505 to Android 4.3. Warranty may be void of your device after rooting! If anything given on this page damages your device and its components — you only will be held liable for it. theAndroidSoul.com takes no guarantee for the safety of your device. You must check your device’s model no. in ‘About device’ option under Settings. OR, you can also check the model no. on the packaging box of your device. This page is meant only for the Samsung Galaxy S4, model no. GT-I9505. Do NOT follow the procedures provided on this page for any other device, than GT-I9505, including GT-I9500, as this could damage that device. You must do this pre-installation stuff before attempting to install the firmware on your Galaxy S4 in order to avoid any complications later, and have a smooth and successful process. Back up important data and stuff before you start playing around here as there are chances you might lose your apps and app-data (app settings, game progress, etc. ), and in rare case, files on sd card, too. You must have proper and working driver installed on your windows computer to be able to successfully install a firmware on your Samsung Galaxy S4. In case you’re not sure, follow the link below for a definitive guide for installing driver for your Galaxy S4 on your computer. If either phone or your PC powers off due to lack of battery, it could damage the phone. So, make sure both your android device and PC are charged, 50% is what we would recommend. └ Use original USB cable to connect your phone to PC. └ Do not use the procedures given below on Mac (using VMWare) as it works best on proper Windows PC only. Double-click (run) to open the “Odin3 v3.09.exe” file to start Odin. Power off your phone first. Wait for 6-7 seconds after display is off. Press and hold these 3 buttons together until you see Warning! screen: Volume Down + Power + Home. Press Volume Up now to continue to Download Mode. Connect Galaxy S4 to PC. Odin window will show an Added!! message in bottom left box. Make sure you have installed driver for Galaxy S4 as said above in ‘Prepare Yourself’ section. If you have already installed driver, try uninstalling it and then reinstalling it. Try a different USB cable. The original cable that came with your phone should work best, if not, try any other cable that’s new and of good quality. Connect using a different USB port on your PC. Reboot phone and PC and then try again. └ The Odin window may freeze and show “(Not responding)” alert but that’s only because of the large size of the AP file. Nothing to be worried about, it’ll get back to normal by itself. If possible, don’t use your PC for other tasks when loading the file. Now in the “Option” section of Odin, keep only the “Auto Reboot” and “F. Reset Time” boxes checked. All other boxes in the “Option” section should be kept unchecked. Double check the above two steps carefully. You must not make any mistake with the steps above or else you may brick your device. Click the ‘Start’ button to begin flashing I9505XXUEMJ5 firmware on your Galaxy S4 GT-I9505, and wait until you see a ‘PASS!’ message in Odin’s top left box. When you get PASS! message, your phone will restart automatically. You can then disconnect your phone from PC. └ If you see FAIL instead of PASS in Odin’s top left box, disconnect your Galaxy S4 from PC, close Odin, remove phone’s battery and put it back inside in 3-4 seconds, open Odin and then repeat from Step 3 of this guide again. Enjoy Android 4.3 on your Galaxy S4! Your device will automatically reboot and boot into Android 4.3 firmware version I9505XXUEMJ5. Have fun! By performing a Wipe data/Factory Reset through recovery all your phone’s data will be deleted including internal SD Card. So make sure to backup your phone before proceeding. First power off your phone. └ If phone gets stuck at Samsung logo and reboots again and again, then remove and then re-insert the batter back into phone. Press and hold Home + Volume Up + Power key together until the screen turns on, then release the keys to boot into recovery. 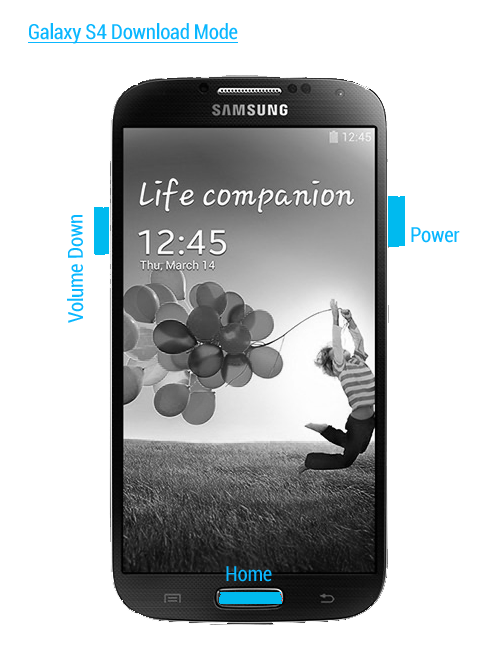 Once you are in recovery mode, use Volume keys to move the selection up and down and Power key to select an option. Go to Wipe data/Factory Reset in recovery and select it. Then select Yes to confirm factory reset on next screen. This should fix bootloop on your Galaxy S4 GT-I9505 and other firmware related issues. It was easy, right? Let us know what you think about this article. Your suggestions are most welcomed! And if you need any help regarding updating your Galaxy S4 to Android 4.3, feel free to ask us in comments below.